Third collaboration between KEIJI HAINO, one of the most prolific artists of the Japanese experimental / noise scene, and the critically acclaimed ensemble ZEITKRATZER who enthuse with stunning interpretations of STOCKHAUSEN compositions. 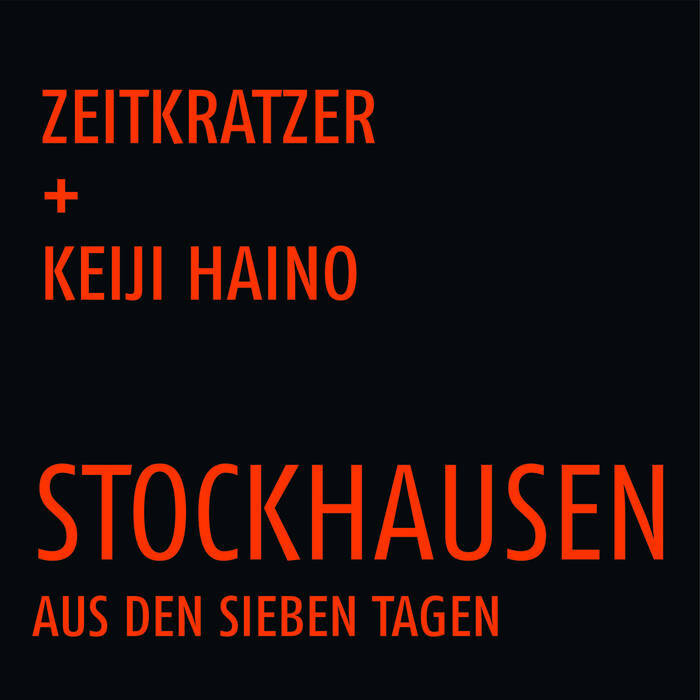 When KEIJI HAINO heard ZEITKRATZER rehearse for their Stockhausen performance at the Ruhrtriennale festival he spontaneously decided to join the group for that part of the programm too (HAINO was initially invited for what was released as ZEITKRATZER + KEIJI HAINO: Live At Jahrhunderthalle Bochum). Here too HAINO, one of the most prolific artists of the Japanese experimental / noise scene, focuses on his voice while ZEITKRATZER create the instrumental environment applying their extended techniques of amplification and unique skills as musicians. Once again the ensemble proves its outstanding quality that has gained them high reputation with recordings of such diverse artists / composers like THROBBING GRISTLE, CARSTEN NICOLAI (ALVA NOTO), LOU REED’s “Metal Machine Music” or JOHN CAGE and ALVIN LUCIER. “Aus Den Sieben Tagen” delivers 5 pieces of STOCKHAUSEN’s collection of in total 15 text compositions that he had written in may 1968 in reaction to a personal crisis and which the great renovator of 20th century music characterized as “intuitive music” – music primarily played by intuition rather than the intellect of the performer(s) where not one single note is defined. Which gives the musicians much space for interpretation – ZEITKRATZER and KEIJI HAINO demonstrate impressively that they know how to use this freedom!